Size: 6 x 5 x 3.1cm / 2.36 x 1.97 x 1.22"
Mounting holes: 3.2mm diameter, for M3 screws. Max Current: 25A (Enhance heat dissipation) safe for prolonged times. ensure active cooling of the heatsink. This module under the premise of normal cooling, found at I (Max) = 25A stable work situation, the process of using the current not exceed 25A. 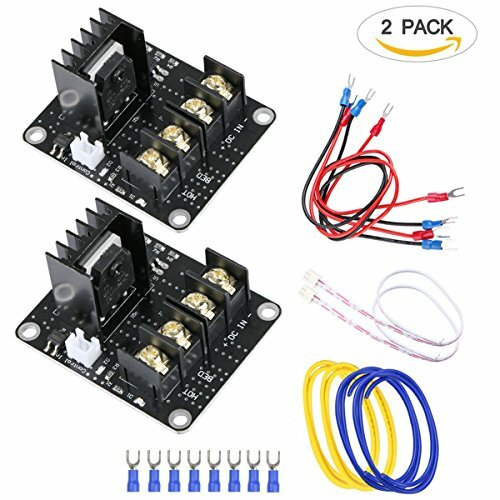 Package includes: 2 x Heated bed power modules (motherboard is not included) and 2 x connection cables for input signal. BONUS: 4 x Power cables, 4 x hot bed connect cables. Application: This high power module is a general add-on heated bed power expansion module for 3D printer. It can work with the Anet A8. Good Protection: When using heated bed 3D printer for 12V power supply which may cause excessive current during times, with this module, it can well protect the connectors on the controller board from burning. 25A Maximun current: This high power module helps your 3D printer equipped with the Chitu controller board (capable of max 15A) become even more powerful. With this add-on module to board lead the maximum current up to 25A. Motherboard: The heat bed power module can be used in both Chitu motherboard and other open 3D printer motherboards. If you have any questions about this product by Unime, contact us by completing and submitting the form below. If you are looking for a specif part number, please include it with your message.